> Risk refers to the variability of expected returns associated with a given security or asset. > The absolute return on an investment for a given period of time; say a year, consists of annual income plus change in the market price of the investment (capital appreciation or loss); total annual income (loss) in terms of the rate of return is expressed as a percentage of the opening market value of the investment. > The two major concerns of an investor, while choosing a security (asset) as an investment, are the expected return from holding the security and the risk that the realized return may fall short of the expected return. Two commonly used approaches to assess risk from a behavioral point of view are sensitivity analysis and probability distribution. To obtain a more concrete measure of’ risk, two statistical measures of variability of return. namely, standard deviation and coefficient cf variation, can be used. > The term, portfolio refers to the collection of securities/assets held by an investor for investment purposes. The risk of a portfolio is measured in much the same way as the risk of a: single asset. However, in the context of a portfolio, the risk of any single proposed investment in a ‘security/asset is not to be viewed independent of other assets/securities already held; additional investments are considered in the light of their effect on the risk and return of the portfolios as a whole. The correlation among assets in portfolio affects the overall risk of the portfolio. The assets (or securities) whose returns are negatively correlated provides the best combination to minimize overall risk, In a way, the concept of correlation, an Integral part of the process of diversification that is used to develop an efficient portfolio of asset/securities. 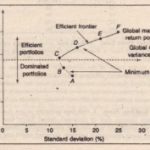 An efficient portfolio is a maximum return portfolio, at a given level or risk.